NVHS DECA chapter members earned the organization’s highest honors at DECA’s annual International Career Development Conference in Atlanta, Georgia, April 21-25. 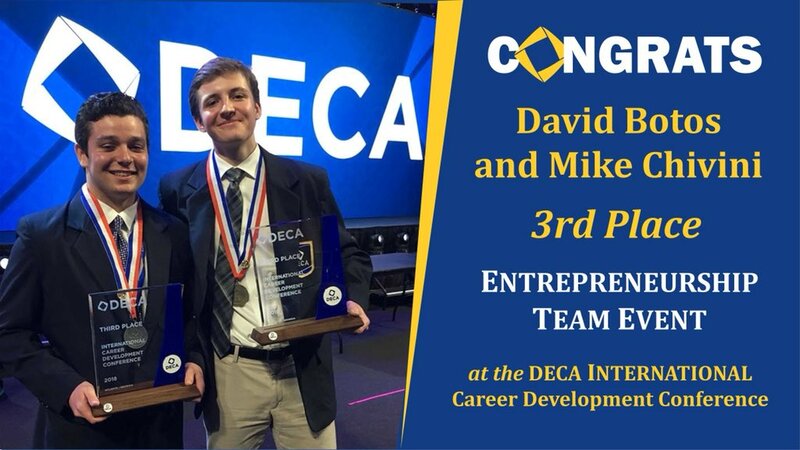 Congratulations to seniors, David Botos and Michael Chivini, for achieving 3rd Place in the Entrepreneurship Team Decision Making Event. During the school year, approximately 120,000 of DECA’s 225,000 student members take part in the organization’s competitive events program, allowing them to compete for local and regional titles. The competitions are designed to simulate real-life business scenarios and test students’ academic understanding and skills development. The top state and provincial winners put their talents to the test during the program’s final round of competition in Atlanta. The DECA International Career Development Conference was the pinnacle of competition where over 15,000 students vied for international honors. Over $500,000 in scholarships and awards were presented to students and teachers for their achievements. This year’s #DECAICDC featured 20,000 members and advisors in attendance. In addition to career-based competition, DECA members engaged in leadership academies and networking opportunities with over 60 internationally recognized businesses.